One of the new spells in the Clash of Kings book is "Blood Boil". Blood Boil -12” range. When rolling to hit, roll a number of dice equal to the amount of damage on the target unit. Roll to damage with Piercing (1). The spell can be taken by any non-Living Legend with access to spells and costs 25 points. When details of the spell became available, the reaction in some quarters was reflective of the spell's name. There was a post on the Mantic Forum discussing the spell that eventually was closed by moderators due to the level of vitriol being induced. That thread (which can be accessed here) did contain some analysis on the comparative utility of the spell by the book's author, Nick Williams. Much of that analysis centred on whether spamming Blood Boil "broke" the game. Nick was able to show that there were more efficient methods (damage per point spent) available through the use of Breath Weapons and other spells. My interest was not so much around where spamming of certain things broke the game, but more in where the Blood Boil spell out-performed other spells, particularly Fireball and Lightning Bolt. The table above shows the effect of Blood Boil based on the target unit's Starting Wounds and its Defence. 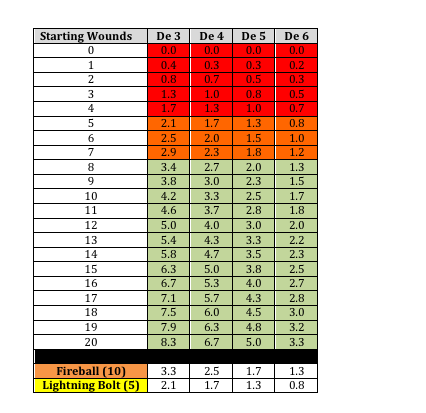 At the bottom are the wounds caused by two common spells - Fireball (10) and Lightning Bolt (5). The colour coding in the table reflects relative performance. If the target unit has 8 or more wounds on it already then the Blood Boil spell statistically out-performs (green). 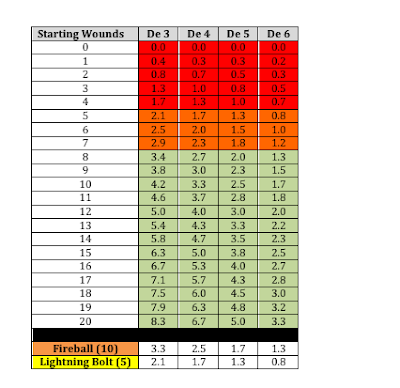 The orange area (5-7 starting wounds) shows where Fireball outperforms Blood Boil and the red area where Blood Boil is out-performed by both spells. This can be a little bit deceptive. The other variable that needs to be taken into account is the Nerve of the target unit. As Starting Wounds begins to approach Nerve the difference in damage output between the three spells becomes less important. e.g. Assume a Horde of Lycans (De 4+) with a Nerve of 15/17. The result you need to achieve is 17-2D6 which is on average 10. (W) means the unit can only be Wavered. The number is the Roll you must make on 2D6 to destroy the unit. As you can see there is very little differentiation between the spells in terms of effect. At most there is a difference of 2 on the 2D6 roll but mostly it is 1. Differentiation increases at high Nerve Values and low Nerve Values. Therefore as Nerve increases on a target unit, Blood Boil will look better whereas at lower Nerve, Fireball and Lightning Bolt are your better options. This is all intuitive however I do think our minds tend to exaggerate the differentiation. Also once you hid 20 wounds any successful spell is likely to result in the unit being destroyed so variation is moot. 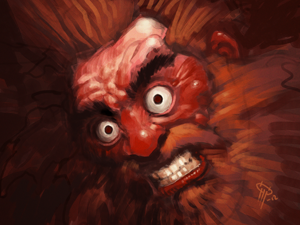 Looking through the books all but Dwarfs and The Herd have access to Fireball or Lightning Bolt. In this case I suspect that Blood Boil will become an extra tool in their kit. This is particularly true for most Herd armies that lack reliable shooting. I'm certainly going to look at trying to shoehorn it into my Herd to give me something I am lacking at the moment. So is the item broken? No. Is it situational? Yes, but probably not as much as you thought. I'm not sure I will get that much use out of it, but I think it is a great addition to the game. It does something a bit different to the current, opens up options, and isn't op.